How lucky we were to have such a fantastic sunny day – and a great crowd – for the ‘Playing the Bridge’ concert yesterday. Playing the Bridge is a cool collaboration which transforms Hull’s Scale Lane Bridge into an interactive musical instrument as part of Hull 2017 City of Culture. It’s the idea of bridge architect Jonathan McDowell who recognised that like the Gamelan, the bridge can be played by striking the metal work to make tuned sounds. It was great to be part of the group of Hull Gamelan players led by Laurence Rugg. 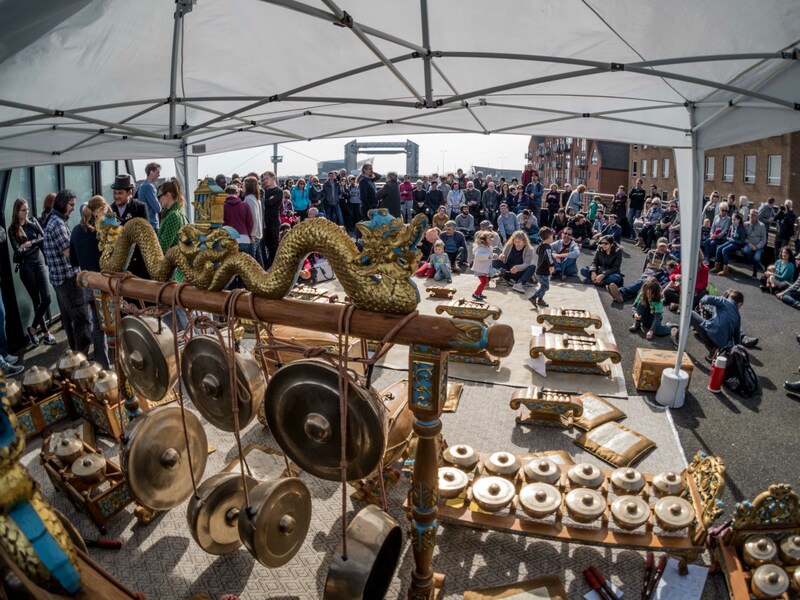 For the first part of the concert the Gamelan was set up in the sunshine on top of the bridge and York Gamelan group and Hull Gamelan players performed a selection of traditional, new and improvised pieces including Alec Roth’s specially commissioned tunes for Hull – Kingston Bells and Bubaran Hull. The second part of the concert took place inside the bridge, where we performed a soundscape work, directed by composer Nye Parry, using Gamelan mallets on the bridge’s metal panels and girders as the main instrument, accompanied by the strings, woodwind and electronic sounds of York ensemble, The Assembled. Big gong sounds using huge metal panels from inside & outside the chamber built to a metallic rhythmic pulse and merged into the drones of cellos, viola, harmonium, wind instruments and bridge parts built to huge ominous crescendos and diminished to delicate hums. The musicians moved around the space and continued to play as they left the chamber where the piece closed with the deep resonant sound of the largest Gamelan gong, the gong ageng. 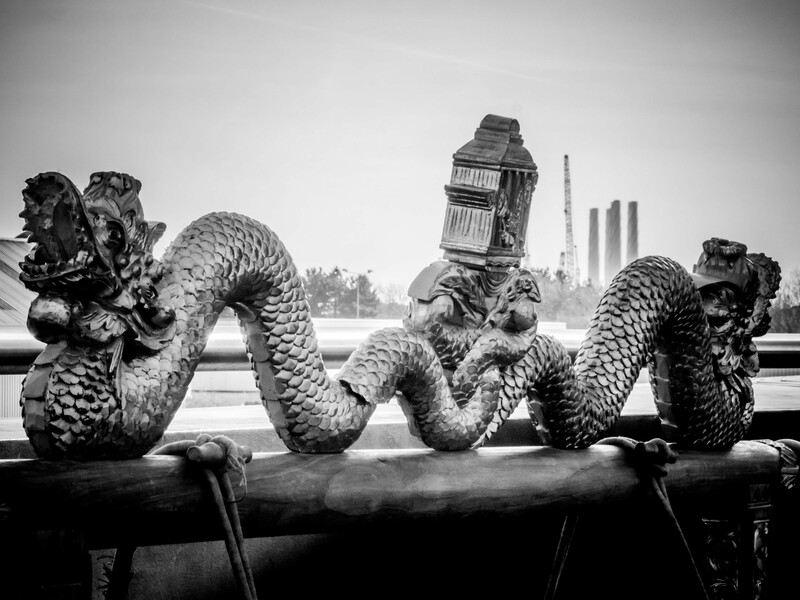 Playing the Bridge is an artistic commission and performance devised by bridge architect Jonathan McDowell and composer Nye Parry who are both Gamelan players – and coordinated here by Hull Gamelan’s Laurence Rugg. The project will culminate in a multimedia installation by Nye Parry and Madi Boyd inside the bridge hub, using sounds gathered in the workshops, as well as interviews and sounds from Qualter Hall, the engineers who built the bridge. These are combined with films created through a collage of hundreds of found images of the bridge under construction. The imagery is abstracted and fragmented into a visual poem that conveys a sense of the complexity of the bridge and reveals the hidden mechanics of the opening mechanism. The installation will be open each weekend throughout April and easter bank holidays (Friday and Monday) from 10am till 4pm. That sounds an amazing project to be involved with and such fun!! I hope it becomes an annual event.